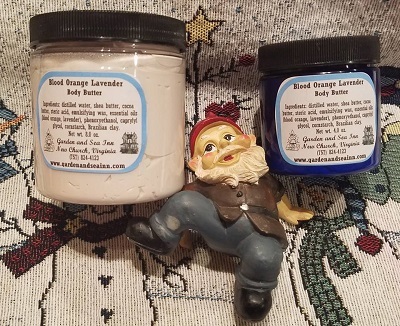 Blood Orange Lavender Body Butter - Hydrate your skin with this wonderful moisturizing body butter made with cocoa butter and shea butter. Made with all natural blood orange and lavender essential oils. Ingredients: distilled water, shea butter, cocoa butter, steric acid, emulsifying wax, essential oils (blood orange, lavender), phenoxyethanol, caprylyl glycol, cornstarch, Brazilian clay. 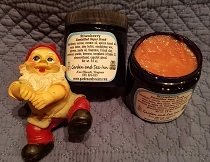 Strawberry Emulsified Sugar Scrub - Get rid of that dry flakey skin with this scrumptious emulsified sugar scrub. No need to stir up the oils and sugar. Great in the shower! Excellent for face as well as body. Ingredients: sucrose, coconut oil, apricot kernel oil, cocoa butter, shea butter, emulsifying wax, glycerin, jojoba oil, fragrance, French clay, arrowroot powder, beeswax, tocopherol (vitamin E), phenoxyethanol, caprylyl glycol.